(Nanowerk News) Dr. Balaji Sitharaman, PhD, an Assistant Professor in the Department of Biomedical Engineering at Stony Brook University, and a team of researchers developed a new, highly efficacious, potentially safer and more cost effective nanoparticle-based MRI (magnetic resonance imaging) contrast agent for improved disease diagnosis and detection. The most recent findings are discussed in detail in his team's research paper "Physicochemical characterization, and relaxometry studies of micro-graphite oxide, graphene nanoplatelets, and nanoribbons", published in the June 7 edition of the journal PLoS ONE. 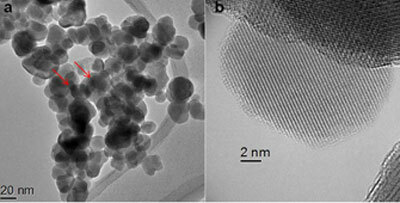 Representative transmission electron microscope (TEM) images of graphene nanoparticles (a-b).The dark spots (red arrow) in panel (a) are the manganese ions intercalated between the graphene sheets. The high resolution TEM images (b) show the planar graphene lattice planes. The MRI, the technology for which was invented at Stony Brook University by Professor Paul Lauterbur, is one of the most powerful and central techniques in diagnostic medicine and biomedical research used primarily to render anatomical details for improved diagnosis of many pathologies and diseases. Currently, most MRI procedures use gadolinium-based contrast agents to improve the visibility and definition of disease detection. However, recent studies have shown harmful side effects, such as nephrogenic systemic fibrosis, stemming from the use of this contrast agent in some patients, forcing the Food and Drug Administration (FDA) to place restrictions on the clinical use of gadolinium. Further, most MRI contrast agents are not suitable for extended-residence-intravascular (blood pool), or tissue (organ)-specific imaging, and do not allow molecular imaging. To address the need for an MRI contrast agent that demonstrates greater effectiveness and lower toxicity, Dr. Sitharaman developed a novel high-performance graphene-based contrast agent that may replace the gadolinium-based agent which is widely used by physicians today. "A graphene-based contrast agent can allow the same clinical MRI performance at substantially lower dosages," said Dr. Sitharaman. The project is a Wallace H. Coulter Foundation Translational Research Award winner and the recipient of a two-year translational grant to study preclinical safety and efficacy. "The technology will lower health care costs by reducing the cost per dose as well as the number of doses required," noted Dr. Sitharaman. "Further, since this new MRI contrast agent will substantially improve disease detection by increasing sensitivity and diagnostic confidence, it will enable earlier treatment for many diseases, which is less expensive, and of course more effective for diseases such as cancer." The new graphene-based imaging contrast agent is also the focus of Dr. Sitharaman's start-up company, Theragnostic Technologies, Inc., which was incorporated in early 2012. The ongoing development of this technology is supported by industry expert and business advisor, Shahram Hejazi, and clinical experts Kenneth Shroyer, MD, PhD, Professor and Chair, Department of Pathology, Stony Brook University, and William Moore, MD, Chief of Thoracic Imaging, and Assistant Professor, Department of Radiology, Stony Brook University. Co-authors of the article include Department of Biomedical Engineering research assistants Bhavna Paratala, Barry Jacobson and Shruti Kanakia; and Leonard Deepak Francis from the International Iberian Nanotechnology Laboratory in Portugal. Dr. Sitharaman's research team focuses their interests at the interface of bionanotechnology, regenerative and molecular medicine. They seek to "synergize" the advancements in each of these fields to develop a dynamic research program that tackles problems related to the diagnosis and treatment of disease and tissue regeneration. Dr. Sitharaman received his BS with Honors from the Indian Institute of Technology and his PhD from Rice University, where he also completed his postdoctoral work as a J. Evans Attwell-Welch Postdoctoral Fellowship recipient.